Eddie celebrated his 70th in true Jordan style. Illustration by David Hopkins. The Norwegian fjords are on Eddie's bucket list. Image courtesy of Shutterstock. So I’ve just turned 70. 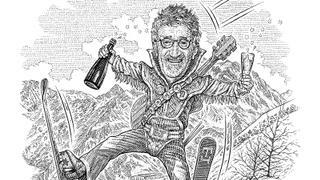 You’ll be pleased to know I celebrated in true Eddie Jordan style, with a huge party up a mountain in Courchevel. There was lots of music, some outrageous behaviour and even a parade of guests who did a striptease down to their budgie smugglers, which had my face printed on them! I’m still having nightmares about that one. I’m lucky to have led a diverse life, so there were people from all walks there: musicians, actors, F1 supremos… A few hundred of my favourite people packed into the same place at the same time. At one point, Mike Rutherford from Genesis was jamming on stage with former F1 champ Damon Hill, with me on the drums. My good buddy Richard Hadida, the new owner of Oyster Yachts, was there with his family. But the best thing was having all my kids and grandkids with me, even if my son Zak penned a very unflattering poem for the event in which he calls me an “eejit”! Anyway, I’ve already booked the place for my 80th. The birthday has got me thinking a bit about my ultimate cruising bucket list. Despite all my sea miles, there’s still plenty of places I want to see. 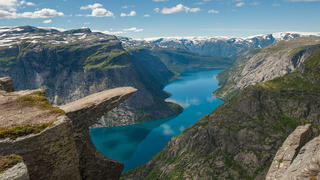 I’ve banged on about pining for the fjords before, but I’ve given it a bit more thought recently. Rather than heading up to Norway on our own boat, I’ve thought about getting on one of those very small, exclusive cruise ships. I’m not interested in some massive floating block of flats with thousands of guests on board and all-you-can-eat buffets. But a smaller ship where everything is arranged for you definitely appeals. The Irish businessman Michael Smurfit is a friend of mine. He owns the 49 metre CodecasaLady Ann Magee, and he often goes off for a week on a cruise ship somewhere and he says it’s a very low-hassle way to spend your time. I’d also like to go back to Fiji and go through the Suez Canal. Asia fascinates me. Interestingly, the Yacht Club de Monaco is organising a trip to Angkor Wat, which apparently you can get to by boat. I think about returning to the Galápagos Islands as well. I think it’s really important to keep a list of all the places you want to visit. It’s too easy to get sucked into the milk run, and end up parked outside Saint-Tropez all summer. You really need a five-year cruising plan or else you’ll never end up going anywhere. And if you’re in the Med, think about moving the boat to different home ports. This year, we’re moving Lush to Sicily for the summer, and I’m looking forward to exploring there. As for a crew? I’d love to cruise with Jack Nicholson. In terms of a laugh, I don’t think you’d get much better than him. I’d dig up Elvis, obviously. You’d have to have him on board. He really kicked off when I was a kid and really inspired a lot of the music that I love. Mandela was such a legend for me – what he stood for and the quality of the man. I’d invite Oscar Wilde along as well. Just so we could all enjoy his greatness and brilliance. He could sit back and document it all. I’d do my best to control this motley crew while someone else captained the ship. Maybe Humphrey Bogart; I heard he was a good helmsman.